Jesus sent His disciples out "two by two," never alone. Two men on the road to Emmaus encountered Jesus, and they recognized Him "in the breaking of the bread" (Lk 24:3-35). As promised, "where two or three are gathered in my name, there I am among them" (Mt 18:20). 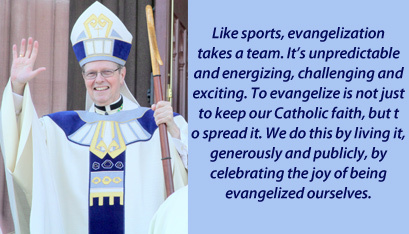 Like sports, evangelization takes a team. It's unpredictable and energizing, challenging and exciting. To evangelize is not just to keep our Catholic faith, but to spread it. We do this by living it, generously and publicly, by celebrating the joy of being evangelized ourselves. I can't spread a faith I only learned about in school, any more than I can engage in a sport I've only watched or read of in a book. I have to get into the game and learn to love and play it. The "game" we are talking about when we speak of evangelizing or spreading our Catholic faith is about our life and what happens to us as we live, die and rise again in the Lord. It's the good news that we have a Savior who loves us and saves us from all that would restrain, poison, wound and, ultimately, try to kill us. For Christians, death is over once we are baptized. To live in and with Christ and His Church -- what baptism initiates -- is to live without fear. Christ has conquered sin and death and, in Him, so have we. Amazing, but true! The first Christians were expert evangelizers. They experienced the explosive, transforming power of the death and resurrection of Jesus. Though Jesus kept predicting it, that took most of them by shock once it happened. People crushed on Good Friday were, three days later, jumping for joy. The Gospel changes lives! Anyone willing to turn to Jesus Christ, to trust Him as the ground and center of your life, to let Him be your Savior, knows this. Once experienced, the joy of the Gospel must be shared together by people of faith. That's evangelization! Pope St. John Paul II, in his encyclical "Redemptoris Missio" (1990), details how the four Gospels treat evangelization. They all speak of the experience of it as a mission, continuing the mission of Jesus; and as a mandate to evangelize, impelled by the Holy Spirit, dwelling in the Church and the hearts of all believers. Evangelizers are missionaries. "All the evangelists, when they describe the risen Christ's meeting with His Apostles, conclude with the 'missionary mandate:' 'All authority in heaven and on earth has been given to me. Go therefore and make disciples of all nations...and lo, I am with you always, to the close of the age' (Mt 28:18-20; Mk 16:15-18; Lk 24:46-49; Jn 20:21-23)" (no. 22). This is a sending forth in the Spirit, apparent in the Gospel of John: Christ sends His own into the world just as the Father has sent Him, and to this end He gives them the Spirit. Luke links the witness the Apostles are to give to Christ with the working of the Spirit, who will enable them to fulfill the mandate they have received. "The different versions of the 'missionary mandate' contain common elements....First, there is the universal dimension of the task entrusted to the Apostles, who are sent to 'all nations' (Mt 28:19); 'into all the world and...to the whole creation' (Mk 16:15); to 'all nations' (Lk 24:47); 'to the end of the earth' (Acts 1:8). Secondly, there is the assurance given to the Apostles by the Lord that they will not be alone in the task, but will receive the strength and the means necessary to carry out their mission. The reference here is to the presence and power of the spirit and the help of Jesus himself: "And they went forth and preached everywhere, while the Lord worked with them" (Mk 16:20)'" (no. 23). Evangelization is always a team activity, in and through the Church, because it's a mission that was given to the Church, and it is accomplished in different ways. "As for the different emphases found in each version, Mark presents mission as proclamation or kerygma: 'Preach the Gospel' (Mk 16:15). His aim is to lead his readers to repeat Peter's profession of faith: 'You are the Christ' (Mk 8:29), and to say with the Roman centurion who stood before the body of Jesus on the cross: 'Truly this man was the Son of God!' (Mk 15:39). In Matthew, the missionary emphasis is placed on the foundation of the Church and on her teaching (Mt 28:19-20;16:18). According to him, the mandate shows that the proclamation of the Gospel must be completed by a specific ecclesial and sacramental catechesis. "In Luke, mission is presented as witness (Lk 24:48; Acts 1:8), centered especially on the resurrection (Acts 1:22). The missionary is invited to believe in the transforming power of the Gospel and to proclaim what Luke presents so well: conversion to God's love and mercy, the experience of a complete liberation which goes to the root of all evil, namely sin. "John is the only evangelist to speak explicitly of a 'mandate,' a word equivalent to 'mission.' He directly links the mission which Jesus entrusts to His disciples with the mission which He Himself has received from the Father: 'As the Father has sent me, even so I send you' (Jn 20:21). Addressing the Father, Jesus says: 'As you sent me into the world, so I have sent them into the world' (Jn 17:18). The entire missionary sense of John's Gospel is expressed in the 'priestly prayer:' 'This is eternal life, that they know you the only true God, and Jesus Christ whom you have sent' (Jn 17:3). The ultimate purpose of mission is to enable people to share in the communion which exists between the Father and the Son. The disciples are to live in unity with one another, remaining in the Father and the Son, so that the world may know and believe (cf. Jn 17:21-23). This...makes us understand that we are missionaries above all, because of what we are as a Church whose innermost life is unity in love, even before we become missionaries in word or deed. "The four Gospels, therefore, bear witness to a certain pluralism within the fundamental unity of the same mission, a pluralism which reflects different experiences and situations within the first Christian communities. It is also the result of the driving force of the Spirit Himself; it encourages us to pay heed to the variety or missionary charisms and to the diversity of circumstances and peoples. Nevertheless, all the evangelists stress that the mission of the disciples is to cooperate in the mission of Christ: 'Lo, I am with you always, to the close of the age' (Mt 28:20). Mission, then, is based not on human abilities but on the power of the risen Lord'" (No. 23). In our mission of evangelizing, Jesus, everyone's Savior, invites us to let Him be our Savior, personally. Salvation is an offer of divine love. Love is always given freely and must be accepted freely, without reservations. The relationship does not connect without mutual consent and commitment. As the Gospels proclaim, this offer is lived, renewed and witnessed to within our community of faith, the Church. We are not alone, but part of a team, along with the Apostles and their successors, guided by the Holy Spirit, who unites us and impels us to the ends of the earth to tell the Good News.